Construit en 1780, Le Prieuré est une pièce unique de la propriété construite par le Seigneur Kenmare local pour un aristocrate français fuyant la Révolution française. Inondé de caractère du vieux monde, cette propriété de la famille O'Donoghue est un lieu d'accueil, le confort et le charme intense. Situé sur le pas de la porte du parc national de Killarney, nous avons deux Courtyard Pierre Cottages tous différents conception et l'agencement. Les chalets sont rentrés dans une cour très belle et très fortifiée. Les cottages Loft et Coach House ont été méticuleusement restaurés entre 2004 et 2006 et vous offriront une retraite de style et de confort. Donc, si vous êtes intéressé par la randonnée, le vélo, le golf, le shopping ou voulez prendre un cours de cuisine tout cela peut être arrangé. Centre ville de Killarney est de 1 km ou une promenade de 10 minutes, dans la direction opposée sur la rivière, vous êtes immédiatement sur une voie piétonne qui serpente son chemin deux kilomètres en 11 000 acres de Killarney National Park, Muckross House & Gardens. A 5 minutes à pied de la CENI. Renseignez-vous sur les promos mi-saison. Demandez aussi sur l'aéroport de pick ups ou Tim vous autour de la conduite «The Ring» et Dingle. S'il vous plaît nous contacter par email ou par téléphone et nous répondrons à toutes vos questions que vous avez. Grand Débarras au large de la cuisine où la laveuse et la sécheuse sont. Le Killarney Brewing Co. est ouvert. Situé sur la route de Muckross - 5 minutes à pied de la ville. Maintenant, servant de la pizza. Absolutely beautiful rental, and great people!! Four of us stayed in one of their cottages for five days and we absolutely loved everything about it. Spacious kitchen, spacious rooms, huge whirlpool tub. We did a lot of hiking and climbing in the area and it really felt like coming back home to comfort. I also made a mistake in booking and our group stayed a day later than we were supposed to. Bernadette was completely understanding and flexible and everything was rectified the morning we left. I really appreciated their kindness. The location was also great, just a mile outside of the downtown area of Killarney, but easily accessible to golf courses, hiking trails Muckross House and Ross Castle. We would absolutely stay here again and recommend it to anybody staying in the Killarney area. This is a beautiful, clean and comfortable place to stay. It is the perfect location for exploring Co. Kerry and the surrounding region. Owners were friendly and ready to give advice on where to eat and get groceries. They also sent information ahead of time on places worth seeing during our visit. The perfect place to stay in Killarney! 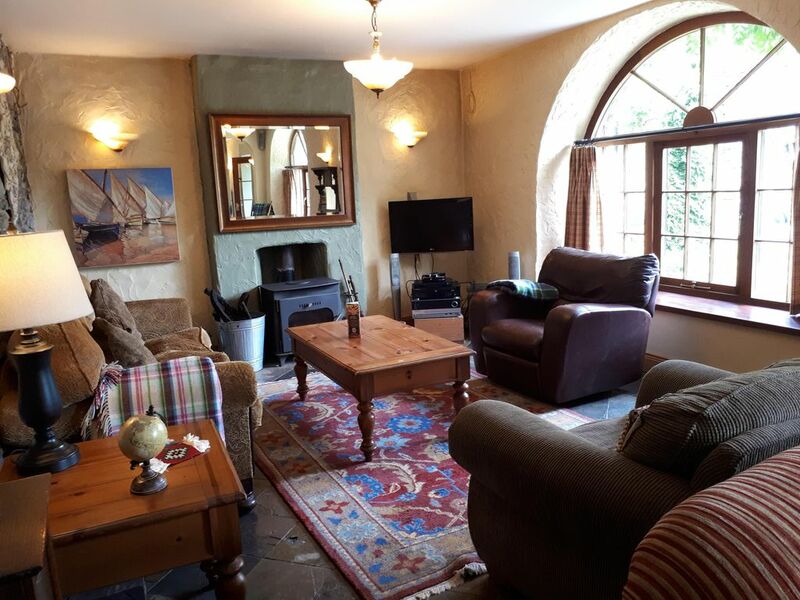 We were in Killarney for an extended vacation and stayed at The Loft at The Priory cottages. The Loft felt like home immediately! It had everything we needed. The rooms were spacious, very clean and comfortable. The beds were very comfortable and had great down comforters.Loved the bathroom with the Jacuzzi tub and steam shower. The courtyard and entrance were beautiful with flowers beginning to bloom again when we left in January. Sparking water is on tap in the courtyard! We spent evenings in front of the wood burning stove or walked to town for music in the pubs. It is the perfect location as it is an easy walk to Muckross House and Abbey and also to Downtown and Ross Castle. A great home base if you are trying to capture a lot of the Wild Atlantic Way in the southwest and west of Ireland. Tim and Bernadette were amazing hosts. Tim offered information on best sights to see in the area including the Skellig Ring and Mizen Head. He had detailed directions printed up on the most scenic routes. Both Time and Bernadette were very welcoming, always available for a question. And they make the best Irish Coffee !! We are looking forward to going back , we hope someday soon. The most comfortable and cozy place we have ever stayed in. Even better than the pictures, we truly enjoyed our stay. The beds were very comfortable, all the rooms are spacious. The 2nd floor full bath has a wonderful jetted bathtub and separate seated shower stall with a rainfall shower head. The kitchen has all the utensils you need to cook meals. There is plenty of seating in the kitchen and living room for everyone. The washer and dryer work well and are very handy for light packers. The location is convenient to downtown if you don't mind a little walk. Nice sidewalks make it safe. The best of our trip. The Loft is in a great location, quiet and within a short walking distance to town. The apartment is well equipped for cooking. We enjoyed the cozy atmosphere with a peat fire on a cool evening.we would definitely recommend. This property is exceptional: authentic Irish, cozy yet lots of room! Donc, si vous êtes intéressé par la randonnée, le vélo, le golf, le shopping ou voulez prendre un cours de cuisine tout cela peut être arrangé. Le centre-ville de Killarney se trouve à 1 km ou 12 minutes à pied. Dans la direction opposée au fleuve, vous êtes immédiatement sur une voie piétonne serpentant 2 km dans le parc national de 11 000 acres de Killarney, Muckross House & Gardens. Killarney Brewing Co. ouvre ses portes Mars à 2015. Il sera 7 minutes à pied sur la route de Muckross. A discount will be provided for a stays over 2 weeks. The check in time is 4 pm and check out is 10 am. We do our best to provide an early check in if needed.